The West Virginia Senate is the upper house of the West Virginia Legislature. There are seventeen senatorial districts. Each district has two senators who serve staggered four-year terms. Senators are elected for terms of four years that are staggered, meaning that only a portion of the 34 state senate seats are up every election. The state legislature meets on the second Wednesday of January each year and conducts a 60-day regular session. Unlike most state senates, the West Virginia Senate can introduce revenue bills. Bills must undergo three readings in each house before being sent to the governor. Bills are drafted by the Office of Legislative Services or legislative staff counsel, reviewed by the sponsor of the bill and submitted for introduction. Bills are assigned to committees that make recommendations about a bill in the form of a committee report. Bills approved in both the West Virginia Senate and West Virginia House of Delegates are then submitted to the governor, who has the power to sign them into law or veto them. The state legislature can override the veto, unless they have already adjourned. The state's districting system is unique in the United States. Prior to the 2010 Census the state's most populous county, Kanawha County constituted two "superimposed" districts. In practical effect, this meant that Kanawha County was a single district electing two members every two years. The remaining 54 counties of the state were divided into fifteen districts, with county lines not respected in most cases. Under the unique rule, no multi-county district (and every district except Kanawha's is a multi-county district) may have more than one senator from the same county, no matter the population. This means, for example, that one of the 5th District's two senators must reside in Cabell County and the other must reside in the tiny portion of Wayne County that's inside the 5th District, even though Cabell County has far more people than the portion of Wayne County that is part of the 5th District. However, both senators are elected by everybody within the district, not just by the people of the county in which the senators reside. Responding to the 2010 Census the Senate redistricted itself. Kanawha County was divided for the first time in the Senate's history, with the northern and western portions joining a part of Putnam County as the 8th District and the remainder of the county constituting the 17th district on its own. This reduced the number of Senators from Kanawha County from four to three, as one of the 8th's must be a resident of Putnam. The remainder of the state was redistricted, reflecting the continuing shift of the state's population to the Eastern Panhandle and to Monongalia County, however no incumbents were placed in districts where they had to run against one another, except for the Kanawha situation. Because senators are elected for four-year terms, the redistricting did not come fully into effect until after the 2014 election. The Senate elects its own president from its membership. Mitch Carmichael is currently the President of the West Virginia Senate. While the West Virginia Constitution does not create or even mention the title of lieutenant governor, West Virginia Code 6A-1-4 creates this designation for the Senate President, who stands first in the line of succession to the office of governor. As stated in Article 7 Section 16 of the constitution: "In case of the death, conviction or impeachment, failure to qualify, resignation, or other disability of the governor, the president of the Senate shall act as governor until the vacancy is filled, or the disability removed." However, the Senate President may not always serve the remainder of the term as the constitution also states: "Whenever a vacancy shall occur in the office of governor before the first three years of the term shall have expired, a new election for governor shall take place to fill the vacancy." President of the Senate/Lieutenant Governor Mitch Carmichael Republican 4 Jackson Co.
President Pro Tempore Donna Boley Republican 3 Pleasants Co. Majority Leader Tom Takubo Republican 17 Kanawha Co. Minority Leader Roman Prezioso Democratic 13 Marion Co. Majority Whip Ryan Weld Republican 1 Brooke Co. Minority Whip Corey Palumbo Democratic 17 Kanawha Co.
^ Hardesty sworn in January 18, 2019. Appointed by Governor Justice to replace Richard Ojeda, who resigned to run for president. 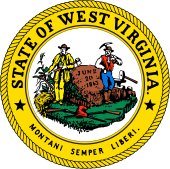 ^ "West Virginia Legislature". Retrieved January 8, 2015. ^ "West Virginia Senate Districts". West Virginia Legislature. Retrieved September 7, 2008. ^ "West Virginia Constitution". West Virginia Legislature. Retrieved September 7, 2008. ^ "Senate District Maps - 2010 Plan". West Virginia Legislature. Retrieved 7 July 2016. This page was last edited on 27 January 2019, at 01:10 (UTC).